352 pages | 52 B/W Illus. There is a perennial gap between theory and practice, between academia and active professionals in the field of disaster management. This gap means that valuable lessons are not learned and people die or suffer as a result. This book opens a dialogue between theory and practice. It offers vital lessons to practitioners from scholarship on natural hazards, disaster risk management and reduction and developments studies, opening up new insights in accessible language with practical applications. It also offers to academics the insights of the enormous experience practitioners have accumulated, highlighting gaps in research and challenging assumptions and theories against the reality of experience. Disaster Management covers issues in all phases of the disaster cycle: preparedness, prevention, response and recovery. It also addresses cross-cutting issues including political, economic and social factors that influence differential vulnerability, and key areas of practice such as vulnerability mapping, early warning, infrastructure protection, emergency management, reconstruction, health care and education, and gender issues. The team of international authors combine their years of experience in research and the field to offer vital lessons for practitioners, academics and students alike. 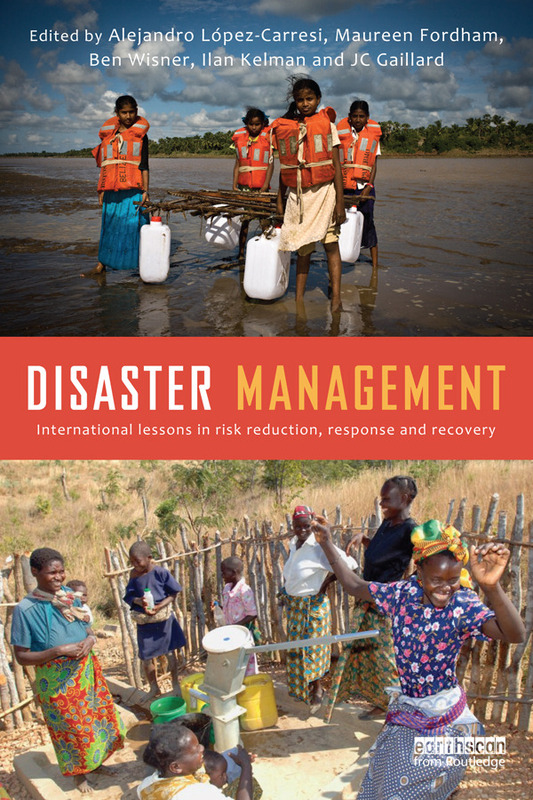 "The book is written for communities and social practitioners to understand the whole process of disaster management. It is reassuring to learn that laws to combat disasters are introduced in almost all countries and are backed up by national action plans and capacity building." Alejandro López-Carresi is founder and director of CEDEM Centre for Disaster and Emergency Management in Madrid, Spain. Maureen Fordham is Principal Lecturer and Enterprise Fellow at the Department of Geography, Northumbria University, UK. Ben Wisner, who has worked in development and hazards for 47 years, is a research affiliate at University College London, UK. Ilan Kelman is a Senior Research Fellow at the Center for International Climate and Environmental Research – Oslo (CICERO) in Norway. JC Gaillard is an Associate Professor in the School of Environment at the University of Auckland, New Zealand.